PredictionIO is an open source machine learning server application written in Scala. It provides an easy to use REST API to build recommendation engines. It also provides client SDKs, which wraps the REST API. The Client SDKs are available in Java, Python, Ruby, and PHP programming languages. PredictionIO core is using Apache Mahout. Apache Mahout is a scalable machine learning library which provides various clustering, classification, filtering algorithms. Apache Mahout can run these algorithms on distributed Hapoop cluster. As a user, we do not have to worry about all these details. We can just install PredictionIO and start using it. Read the docs to get more information. I decided to learn PredictionIO because I wanted to use a library which can help me add machine learning capabilities. PredictionIO can help with functionalities like recommending interesting items and discovering similar items to users. There are multiple ways to install PredictionIO as mentioned in the docs. I used the Vagrant approach as it helps me avoid messing up with my machine and set up everything itself. 1. Download the latest vagrant package for your operating system. You can get latest package from http://downloads.vagrantup.com/. 2. Download and install VirtualBox. Please refer to https://www.virtualbox.org/wiki/Downloads. 3. Download the latest PredictionIO vagrant package from https://github.com/PredictionIO/PredictionIO-Vagrant/releases. 4. Unzip the PredictionIO-x.x.x.zip package. This package contains the necessary scripts to setup PredictionIO. Open the command line terminal and change directory to PredictionIO-x.x.x. The vagrant script will first download the Ubuntu vagrant box, and then will install all the prerequisites — MongoDB, Java, Hadoop, and PredictionIO server. This will take a lot of time depending on your connection. If you are at a location where internet connection is not stable, then I recommend that you download the Ubuntu box using wget. The wget command supports resuming partial downloads. Download the precise64 box to a convenient location as shown below. After the download is complete open the Vagrantfile and change the config.vm.box_url property to point to the precise64.box download directory. 5. Now just do vagrant up to start the installation process. This will take time depending on your internet speed. 6. Next we will have to create administer account as mentioned in the docs http://docs.prediction.io/current/installation/install-predictionio-with-virtualbox-vagrant.html#create-an-administrator-account. 7. The server application will be available at http://localhost:9000. Read more at http://docs.prediction.io/current/installation/install-predictionio-with-virtualbox-vagrant.html#accessing-predictionio-server-vm-from-the-host-machine. You will be asked to login to the PredictionIO application, once loggedin you will see dashboard as shown below. We will start by creating blog-recommender application. Click on Add an App button and enter name as blog-recommender. After application is created you will see it under Applications as shown below. Next click on Develop and application details will be shown to you. The important information here is App Key. This is required when we will write our application. The usecase that we are implementing is similar to Amazon “Customers Who Bought This Item Also Bought these items” feature. Our usecase is people who viewed this blog also viewed these blogs. Now that we have created PredictionIO application its time to write our Java application. We will be using Eclipse to develop the application. I am using Eclipse Kepler which has m2eclipse integration built in. Create a new Maven based project by navigating to File > New > Maven Project. Choose the maven-archetype-quickstart and then enter Maven project details. Replace the pom.xml with the one shown below. The things to note in above is the Maven dependency for PredictionIO Java API. Now we will write a class which will insert data into PredictionIO. The class is shown below. We create instance of Client class. Client is the class which wraps the PredictionIO REST API. We need to provide it the API_KEY of PredictionIO blog-recommender application. 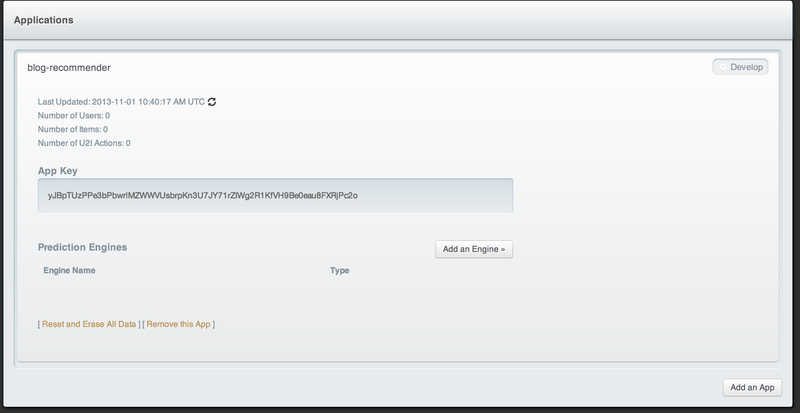 Next we created two users using Client instance. The users get created in PredictionIO application. Only mandatory field is userId. Next we performed some actions on items. The user “shekhar” viewed “blog1”, “blog2”, and “blog4” and user “rahul” viewed “blog1″,”blog4”, “blog6” , and “blog7”. Finally, we closed the client instance. Run this class as a Java application. 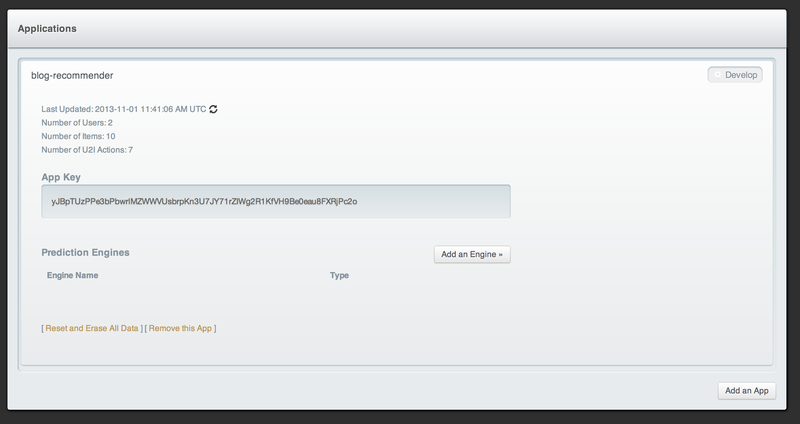 It will insert records in PredictionIO application instance which you can verify by looking the the dashboard. Now that data is inserted into our PredictionIO application we need to add engine to our application. Click on Add an Engine button. Choose Item Similarity Engine as shown below. Next create Item Similarity Engine by entering name as “engine1”. After pressing Create button you will have Item Similarity Engine. Now you can make some configuration changes but we will use the default settings. Go under Algorithms tab and you will engine is not running. Run the engine by clicking “Train Data Model Now”. Now wait for few minutes as this takes time. After data model is trained you will see status as Running. The usecase that we are solving is to recommend blogs to user depending on the blog he has viewed. In the code shown below, we are getting all similar items to blog1 for userId “shekhar”. Run the Java program and you will see result as “blog4″,”blog5″,”blog6” , and “blog7”. As you can see from the above example, it is very easy to add recommendation capabilities to the application. I will use it in my future projects and spend more time on it. That’s it for today. Keep giving feedback.